Experience an extreme paintball adventure like no other! Come on a Delta Force Paintball experience and you’ll be entertained on our movie-set scenarios with the best equipment in the industry. More than 4 million players have been safely entertained at our paintball centres around the globe! That’s a feat we are extremely proud of and is one of the reasons why we are the world’s largest operator of paintball games. 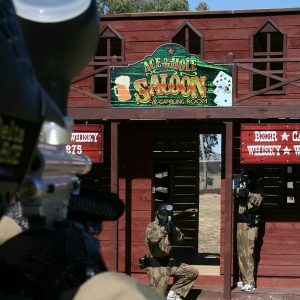 From our first paintball centre just south of London some 20 years ago, we have now grown to be the leading paintball operator in terms of movie-set game zones, professional staff and most importantly of all, safety. Your safety is our paramount concern and we ensure that all players are treated like celebrities. 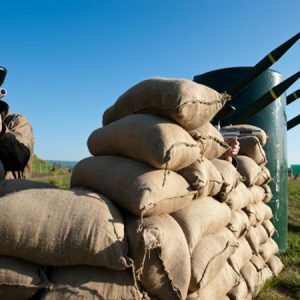 On arrival at our world-class paintball centres you will receive all of the essentials for battle including protective goggles with anti-fog lenses, full-length camouflage overalls, body armour to protect your upper torso and a battle pack capable of carrying an additional 400 paintballs. That’s enough to ensure you never run dry in the heat of combat. After going through the essential safety briefing, you and your fellow comrades will be taken through to the gun zone where you will be issued with a 0.68 Inferno paintball machine gun. This well-finished piece of machinery is fast firing, accurate and reliable. Take advantage of our top-secret shooting range and get your eye in for the games ahead. In between the action you’ll get time to rest and reload in our themed base camp. Complete with picnic tables and a kiosk you can talk tactics with your team or reenergise with some food and a drink. With over 1000 professionals working for Delta Force around the world, you can rest assured that we have the staff and capabilities to provide you with the ultimate paintball adventure. We are the industry leader in terms of moving the sport forward into the next era. Delta Force initiatives continue to make the game safer, more enjoyable and action-packed for all. 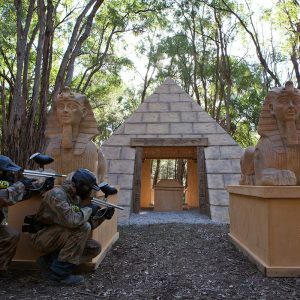 State of the art paintball equipment, impressive safety standards and amazing movie-themed paintball game zones are all contributing factors to Delta Force becoming the world’s biggest and best paintball company. Come and see what all of the hype is about, come and play with Delta Force Paintball. There is not other paintball experience like it!